GALLIPOLIS — River Valley High School students in the Mock Trial Program recently had the opportunity to observe a real court trial. 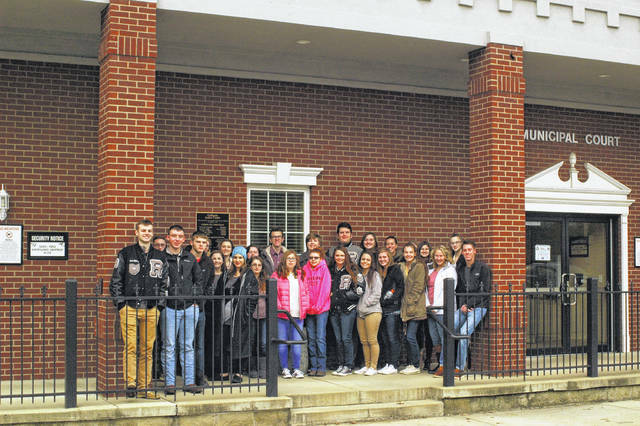 Juniors and seniors, who have to be in AP classes, were invited by Gallipolis City Solicitor Adam Salisbury, the Municipal Court, and Judge Eric Mulford to sit in and observe the legal proceedings. They also got the chance to tour the facility and see the workings of the justice system. Salisbury was involved with the case and works with the Mock Trial program to help educate RV students about the legal system. He explained that there are multiple benefits of students witnessing court in person. By seeing the process in person they learn how the system works and what a court trial is like; learning to stand when the judge enters the room and seeing the back and forth interaction with attorneys and how to question witnesses on the stand. All of that is necessary for the students before they go to competition. “First, it shows them that actions have consequences. When they see people come to court and the reason that they are there, that they have violated the law and there are consequences,” said Salisbury. Students also toured the county jail and holding cells, the Justice Center on Second Avenue, and got to see real people plead their case, an eye opening experience for the students. “I’m thankful for the opportunity to be a part of the Mock Trial program and Mrs. Graham and Mr. Edwards for allowing me to participate,” said Salisbury. Students also had a productive learning experience. “Today I’ve seen how what we learn in Mock Trial is being put to use everyday in court. These skills are vital for our society’s structure and our judicial system,” said Sophie Branham. All of the students in the Mock Trial program are given a role and task to perform during their competition that simulates a real court case. “I’m going to be an attorney so it helped me a lot on how to question witnesses and how to act in the courtroom,” said Adrianna Powell. Salisbury was very appreciative of all of the judges in Gallia County who support and donate their time to Mock Trial students. Judge Dean Evans was on the bench Thursday while the students observed, filling in while Judge Mulford was away.